Lisbon was absolutely wonderful. You may be wondering why we picked a place to vacation that had many similarities to San Francisco, but trust me, there were a lot of things that were different about Lisbon. What was different? Lisbon is sunny and warm for the majority of the year, the food's different, the people, the culture, and it's clean! I could go on and on. This first post sums up our first few days exploring Lisbon. (Exploring = mostly eating and drinking.) Coming up next will be our trip to the Azores- the islands off the coast of Portugal. We stayed in a cozy Airbnb that was little off the beaten path. It was nice to explore neighborhoods that we wouldn't have seen if we stayed in the heart of downtown the whole time. The perfect outfit to cruise the streets of Lisbon in. Another thing we would have missed out on is seeing this Osgemeos mural! First meal in Lisbon at Ground Burger. It was no In-n-Out, but still pretty impressive to say the least. The inside vibes at Ground Burger. So hip! 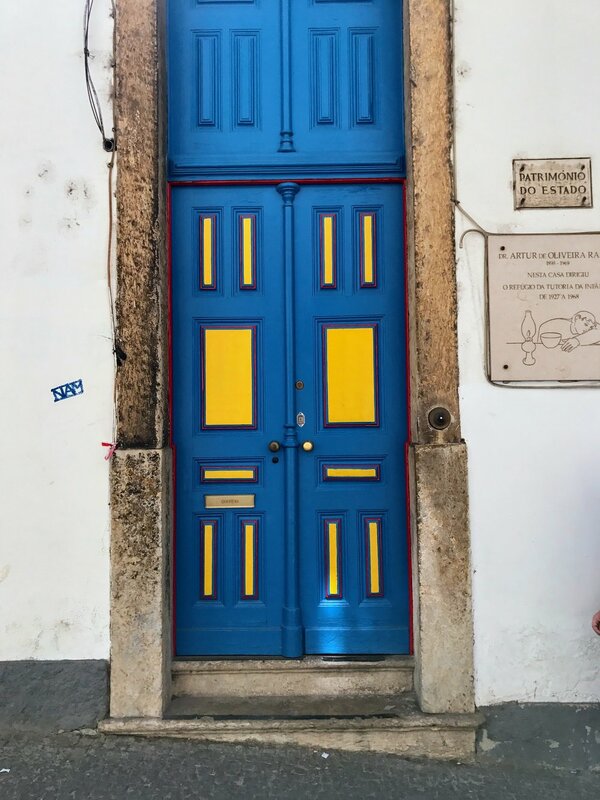 Exploring Alfama- you have to take the time to spend a day going to the oldest district in Lisbon, Alfama. It's tucked way up in the hills of Lisbon. The streets are so tiny cars can barely fit in them. You can take the tram up (pictured below) or you can take a Tuk Tuk. The tram gives you the authentic experience, but the line is LONG. If you decide to go this route, get there early. Otherwise, you will be in line for 2 hours. The Sao Jorge castle is there too. (We skipped this, but its supposed to be awesome!) If you are in Alfama at night you can hear live Fado music playing at a few restaurants. The infamous Tram 28! Did you know Lisbon trams were originally called Americanos? A local taking a cigarette break. A LOT of people smoke in Lisbon. We had lunch at the cutest circus themed restaurant. Do people really live here?? Exploring downtown Lisbon- Lisbon is one of the safest cities in the world. I feel most cities are not safe anymore, so it was refreshing to hear that. One of our Uber drivers was saying that the biggest crime is people pick-pocketing you. Lisbon is also filled with Moorish tiles. The streets and buildings are covered in them and make every street so unique. Definitely spend a few days exploring downtown for good food and shopping. The was the best Italian spot in Lisbon- Forno d'Oro. It was pretty damn good. Not New York good, but pretty close. Make a reservation! Red Frog speakeasy is a must! They make really fun and innovative drinks. Just like places in New York, you have to ring the doorbell to get in. My beautiful, very girly drink. Always looking for Rick and Morty murals. A sweet little lemonade stand. We did do one touristy thing on our first day and saw Praça do Comércio. There are really cool restaurants and shops underneath the arcs. It's nice to grab a bite to eat and people watch. More city views of Lisbon. The Moorish tiles are everywhere in Lisbon. They are so beautiful and give the the city all of its color. 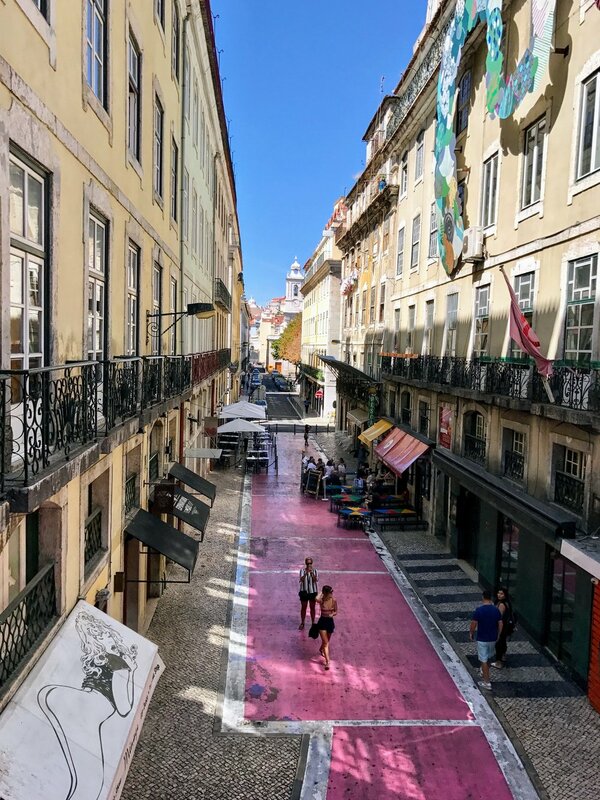 The pink street in Lisbon- this used to be the Red Light District. We grabbed drinks in this risque neighborhood at Pensao Amor. This is another cocktail spot you cannot miss while in Lisbon. We went to the Time Out Market 3 times. It has the best food you'll eat in Lisbon. I think I ate at least 15 slices from Pizza a Pezzi. The Honorato burger. It had mayo, corn, lettuce, tomato, bacon, egg, cheddar. The most beautiful eclairs at L Eclair. More places to eat: LX Factory (also a great place to get gifts for people), Mini Bar, Pasteis de Belem, A Merenderia, The Decadente. More places to drink: Copenhagen Coffee Lab, Lost in, Pharmacia, Cinco lounge. Our first few days in Lisbon were basically walking and eating aka the perfect vacation. The minute you land in Lisbon, you immediately find yourself wanting to embrace the friendly and warm culture. We enjoyed the first few days here very much and were almost sad to leave to head out to the Azores. Up next- our crazy adventure in the islands!